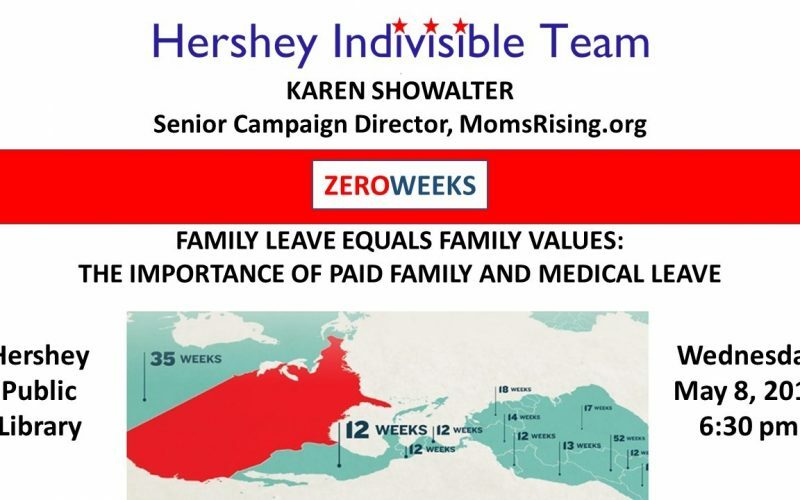 On Wednesday, May 8, 2019, the Hershey Indivisible Team will host Karen Showalter, Senior Campaign Director for Moms Rising for a discussion of “Family Leave Equals Family Values: The Importance of Paid Family and Medical Leave.” The meeting will be held at the Hershey Public Library, 701 Cocoa Ave., Hershey and will begin after a short business meeting that starts at 6:30 pm; doors open at 6 pm. MomsRising is a million-member national network of parents taking action for family economic security. She has over 20 years’ experience running campaigns and building movements locally and internationally around issues ranging from access to education to protecting the right of women and girls. A former Peace Corps Volunteer in Niger, Karen has spoken and written extensively on networks, new media and social change. To supplement the discussion, she will use clips from the video, ZEROWEEKS to reinforce the message of the importance of paid leave. In the United States – one of the richest nations in the world – having a baby, a medical emergency or an aging parent can be a trigger into poverty. The video, ZEROWEEKS explores America’s paid leave crisis, the cost of doing nothing, and what we can do about it. Weaving powerful stories together with insightful interviews with leading policymakers, economists, researchers and activists, ZEROWEEKS lays out a compelling argument for guaranteed paid leave from an emotional, medical, financial and global perspective. If interest warrants, Hershey Indivisible Team will arrange a separate showing of the video. Those in attendance will have the opportunity to sign up in advance. The public is invited to attend and admission is free. For additional information about The Hershey Indivisible Team, contact Marlene Kanuck, Chair, at Contact HIT. The Hershey Public Library does not sponsor or endorse this event nor any product or service offered. Questions? Please Contact HIT.